Because I clearly don’t have enough to do already, I’ve issued myself a challenge to read through as many of the Hugo-nominated works for this year as I can. It’s the first year that I’ve purchased a supporting membership so I can vote, and I want to do it properly, dammit. 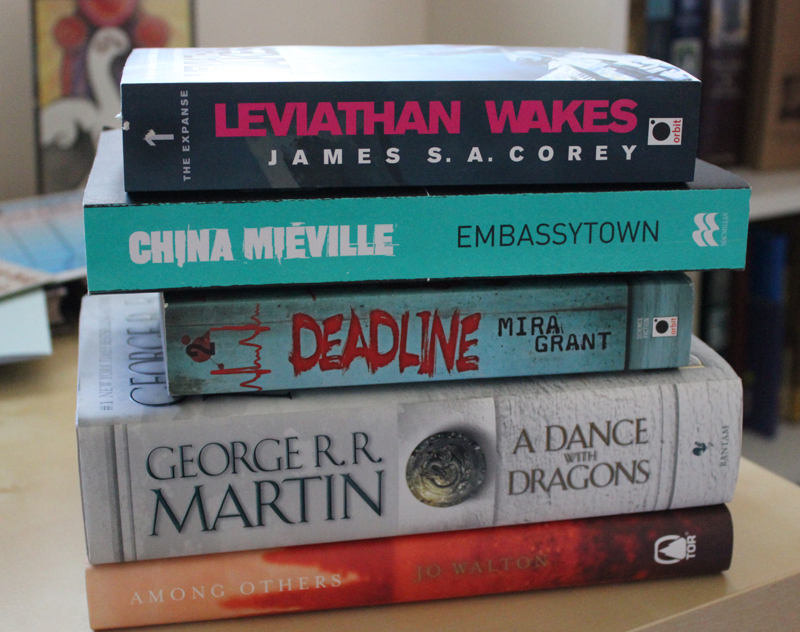 That pile you see there in the photo includes all of the novels nominated this year. Of these, I’ve read Among Others and Embassytown already, but will reread them. The only one that’s going to be problematic is A Dance With Dragons, since I’m only onto book two of the series. I’ll keep reading my way through, and hopefully I’ll get to Dance before voting is due. I have a feeling that it’s going to be tough to pick the best one of this bunch. In Uncategorized Tagged 2012, hugos, hugos challenge Bookmark the permalink. I love reading books. My friends told me once that I’m a book worm . Thanks for posting this 🙂 I love it.